Com - a very special dish of Vietnamese, an indispensable dish in every meal in vietnam. Is also rice, but in each province have different processing and creative ways to have different dishes and bearing the mark of each region. Com Lam is the heart of forests, Chicken rice makes visitors passionate of Hoi An, coconut aromatic rice of Ben Tre ... are all famous dishes far and near. A perfect plan for a holiday in Vietnam do not miss these specialties. 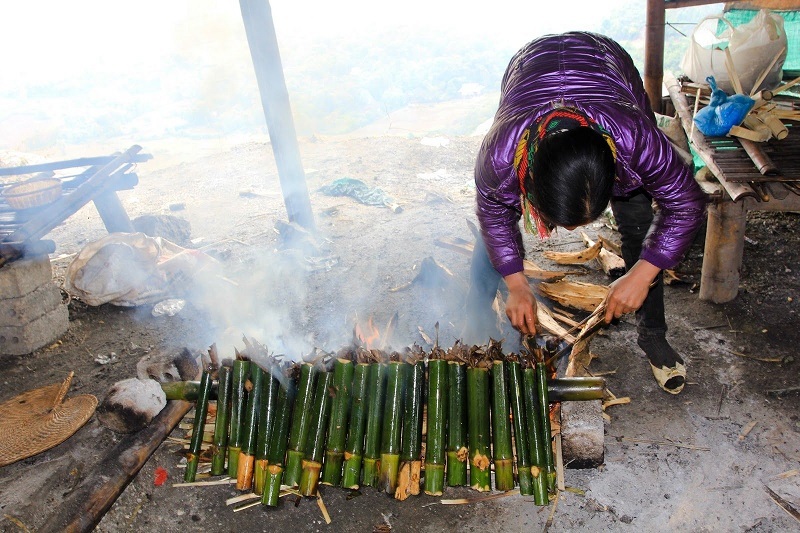 Com Lam is made from rice (usually glutinous rice) and some other ingredients, which are put into bamboo tubes and cooked on fire. When eating, you have to dislodge the black outer layer. Rice delicious food, strange mouth, taste different from normal rice, just remove the rice pipe has seen attractive aroma. Cut the pieces of rice, sesame salt or ground peanut into the mouth, will be delicious, fragrant, flexible, very strong, in addition to the fragrance of sticky rice also fragrant aroma of pine forest through fire . Com Lam is a typical dish of the ethnic groups in the Northwest of Vietnam, the Central Highlands. 'Com chay' (burned rice) is a simple but crispy dish of Ninh Binh province. 'Com chay' is made from steamed rice sliced into flat round shapes. After drying, slices of steamed rice are fried in hot oil pan until they turn yellow and crisp. Together with main ingredient, steamed rice there is beef, pig’s heart or kidney, mushroom, tomato, carrot and spices such as fish sauce, pepper, red chili, onion, salt. Beef and pig’s heart or kidney are thinly sliced, marinated with spices and mixed with vegetables. Then the mixture is fried until fragrant. The dish is best served with goat meat and Kim Son wine. Each bowl of 'com chay' is perfect combination of the crispness of yellow burned rice, oily taste of meat and the freshness of vegetables that wake up visitors‘ taste. 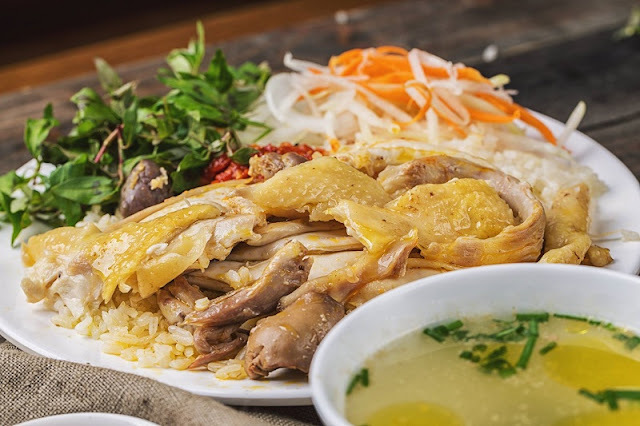 Hoi An chicken rice is very simple: in it’s most bare form, the recipe includes only rice, chicken, sauce and pickled carrots. But it is not easy to cook an exemplary chicken rice plate. 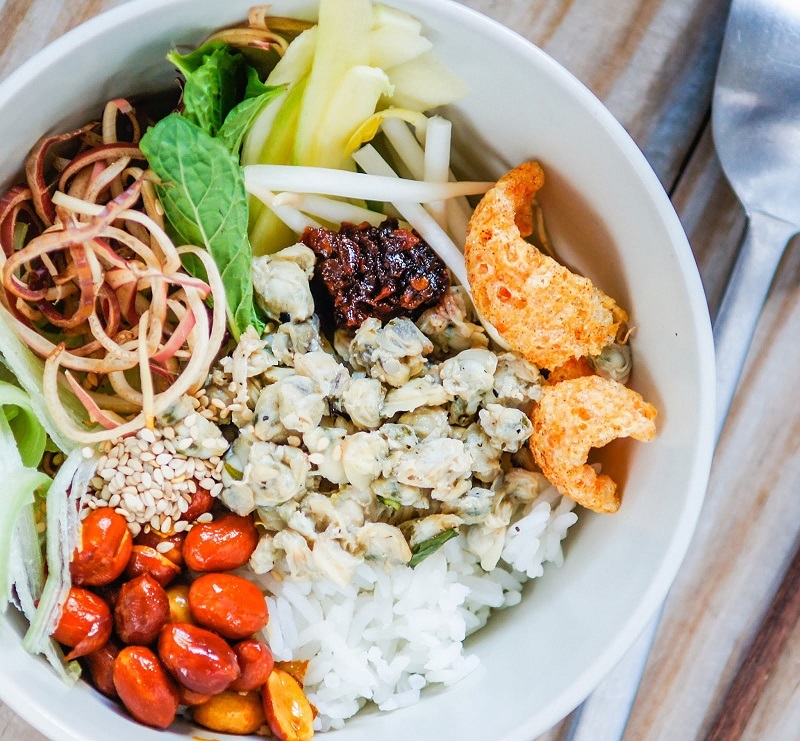 You’ve got to visit the master chefs in Hoi An’s street-side eateries. 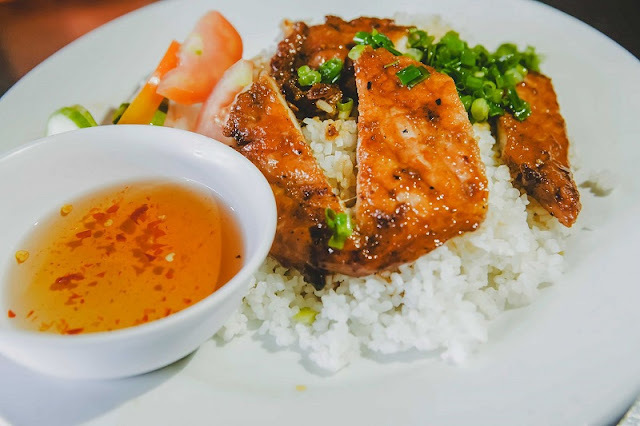 Hoi An chicken rice houses tear their chicken meat into small pieces and then mash the pieces with crushed onions, Vietnamese coriander and other spices best absorb their flavors. The dish is then served up with very spicy chili sauce, pepper to slow the heart various coating mix chicken liver hard, extremely attractive. The springy chicken pieces and fragrant rice is decorated with peppermint, papaya, and salted onions. The spicy dish might burn your tongue a little bit, but it’s an essential part of the cultural experience in central Vietnam. The culinary style in this region is different than the sweeter tastes in the south and saltier dishes in the north. The best cooks use free-range chickens raised in countryside gardens, not the industrial factory-style birds. Poultry raised in the gardens is stronger and more springy, with a far richer flavor than the soggy stuff produced in “industrial agriculture” facilities. The towns of Hoi An are the best place to try the dish. Hoi An even has its own cooking style that varies slightly from other central-region styles. Next is Com Hen – a special delicacy of Hue. With a quite complex recipe, including crunchy cold rice, baby clams, fried pork fat, banana flower, fermented shrimp sauce, sliced star fruit and various spices, Com Hen of Hue brings customers all sweet, buttery, salty, sour, bitter and spicy at once. The contrarian combination between the cold rice and the hot baby clam bouillon makes the dish a bit weird, meanwhile the pickled fruits and vegetables go perfectly with the fat of dried pork fat. It is tempting to enjoy a savory bow of Hue’s Com Hen. 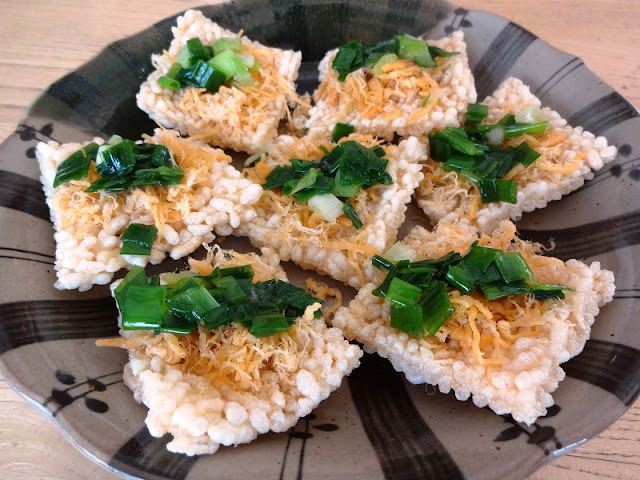 Vietnamese broken rice is a dish made from fractured rice grains. It is also known as Com Tam Sai Gon (Saigon-style broken rice) that is served in the south of Vietnam, especially in Ho Chi Minh City. The main ingredient of this dish is broken rice. Broken rice, which is produced during milling, is a cheaper grade of rice because it contains less nutrient and fiber than unbroken rice. In America or Europe, this type of rice is mainly used in the food industry. In West Africa and South East Asia, it is used for human consumption. Broken rice is usually served with grilled pork, pork ribs, fried egg or pork skin. Pork or pork ribs are marinated with sweet and sour sauce, then are grilled on fire. The smell of grilled pork is very attractive. Pork skin is sliced and mixed with fried rice powder and spices. In addition, greens and pickled vegetable with fish sauce are necessary for a good dish of Com Tam. Com Tam is street food that you can easily have opportunity to try when you visit Ho Chi Minh City or any areas in the South of Vietnam. The prices of Com Tam are usually between 20,000vnd and 30,000vnd. Nowadays, people also have Com Tam with various ingredient for their lunch or dinner. Sometimes, you can find stalls or restaurants where Com Tam is served in the Middle or the North of Vietnam. In early 2012, CNN mentioned Vietnamese broken rice as one of the most attractive street foods in Vietnam. On 1st August 2012, in Faridabad, India, the Organisation of Records in Asia recognized the food value of Saigon-style broken rice and nine other Vietnamese dishes. Hanoi's awesome autumnal brunch - "Banh Duc Nong"
What to eat beyond Pho and Banh Mi in Vietnam?